a pair of harmon/kardon active speakers. Installation: The monitor once out of the box and on your desk is easy to get running, plug the blue connector into your PC and away you go. 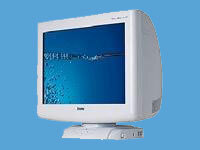 I use this monitor with Windows XP so I had no problems using it as the drivers are loaded into XP. 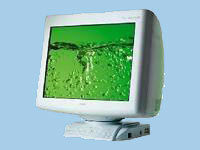 For Windows 98/95/ME you can use the CD (supplied) to configure the monitor properly. 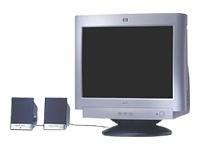 The speakers were the same plug and play no CD required for Windows 98/95/ME just power up. 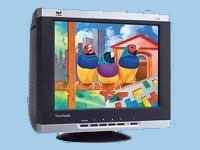 The Quality: The picture quality of the monitor is very good, the image is crisp and clear and the screen is nice and big, the monitor supports high resolutions of upto 1290x1024 with upto an 85 hertz rate for less fickering. The best resolution I find is 1024x768 or the writing is so small you cant read it. Also when you up the resolution the hertz is lowered to prevent damage to the screen so 85 hertz is only available with the lower resolutions. The harmon/kardon active speakers are suprisingly good for there size the sound is usually of a fantastic quality until you you select maximum volume which is tremendously loud but the sound is distorted. Ease of Use: The monitor is easy to get to grips with there are only four buttons a menu/select button, a plus button, a minus button and a power button. When you press the menu button you see many different options all with a useful picture to tell you what they are for example a sun for the brightness control when you are in the menu the menu button becomes the select button enabling you to choose the option you want, when you're done scroll to the exit and press menu/select, easy ! The speakers are even easier to use twiddle the knob clockwise volume up, anticlockwise.. you guessed volume down. Style: The monitor screen case is a dark blue with a matt silver front and hp v72 in dark blue lettering on it, the power light is the standard green which turns orange if there is no signal. There is a TCO 03 sticker too ! The speakers are dark blue with a shiny silver base and harmon/kardon in dark blue letters on the silver bit, the light is a vivid electric blue, nice. The plastic quality is OK but seems a little flimsy. It matches the HP pavilion desktop PC range and goes very well with my a404.uk. 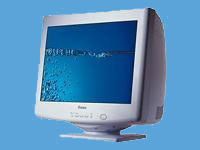 Price: I paid £130 for this monitor and it has yet to dissapoint me, I have owned a Hitachi monitor on which the brigtness and sharpness has gradually faded over time, so far this still is going strong. Help Me: HP offers support for all its products and aims to answer to any of your queries within 1 hour, I have used the support a few times and have always had a very quick response always less than 40 minutes. There is clear instruction booklet and diagrams on how to install too. The Verdict: If you want a good quality monitor and speakers for your hp PC this will not dissapoint you, with its styling it is really exclusively for the hp range and looks rediculous with anything else. I award this 4**** because it is great but would look silly with a grey PC and the plastics do feel a bit cheap. Oh and get it delivered it is a beast to move.